Located on a quiet street 150 metres from the beach, Le Ponteil is a 10-minute walk from the centre of Antibes. It offers free Wi-Fi access. Each room at Le Ponteil has a private bathroom and a TV, and some have individual terraces. The Ponteil is a 10-minute walk from the centre of town, 850 metres from the Musée Picasso, 10 km from Cannes and 15 km from Nice. A car park is available at a surcharge. Less than half a mile from Garoupe Beach, this country-style hotel features an outdoor, heated swimming pool. Guests can relax on the large shaded terrace or in the lounge and use the computers. A minibar and free Wi-Fi access are standard facilities in the rooms at La Garoupe-Gardiole. All accommodations are air-conditioned and some rooms have a private balcony with views of the pool. Hotel facilities include a buffet breakfast every morning and a bar where guests can relax with a drink. There is also a 24-hour front desk with a car rental service and luggage storage. La Garoupe-Gardiole has free private parking on site and both Antibes and Juan-les-Pins town center is a 5-minute drive away. Local attractions include Villa Thuret botanical gardens, which are a quarter mile from the hotel. The Stars hotel is located in the suburbs of Antibes, 2.5 miles from the beach and port. It offers air-conditioned guest rooms, each with a private bathroom and satellite TV. The Stars Antibes offers free Wi-Fi access and guests can enjoy a buffet breakfast on the hotel’s shaded terrace. The hotel bar also provides light meals for lunch and a variety of refreshing beverages. The hotel is situated half a mile from highway A8/E80 and free parking is provided. Guests of the Stars Antibes can access Juan-les-Pins’s beaches in 12 minutes and central Cannes in 15 minutes by car. This Pierre & Vacances residence offers good value, air-conditioned apartments, located in central Antibes, 110 yards from Port Vauban. It has an outdoor swimming pool, Jacuzzi and a sunbathing terrace. All studios and apartments at the Premium Port Prestige have elevator access, a kitchen equipped with a microwave, dishwasher and fridge, a TV and sitting area. Wi-Fi access is available throughout the hotel and guests can relax with a free newspaper in the lounge or on the terrace. The Pierre & Vacances Premium Port Prestige is situated 820 yards from Gare d’Antibes and less than half a mile from the Château Grimaldi. Located in the quiet Cap d'Antibes, the Hotel Miramar is only 33 yards from the beaches of Garoupe. From its terrace you can see the bay and the Southern Alps. The air-conditioned rooms at the Hotel Miramar have free Wi-Fi, satellite TV and offer views of the sea, flower garden or mountains. The hotel features a reading and TV lounge equipped with a piano. There is also a bar and breakfast is served daily in the dining room or out on the terrace. Residence Residéal Antibes is just half a mile from Vauban Port and the Mediterranean Sea. It has studios with a kitchenette and a rooftop swimming pool. The studios at Residence Resideal Antibes have a private balcony or terrace. Each has a kitchenette equipped with a refrigerator, an oven and hot plates to make meals. All studios are serviced by an elevator. Guests can enjoy views of Antibes and the French Riviera on the rooftop terrace with a drink from the bar. The residence also has vending machines with drinks and snacks 24 hours a day. The residence is easily accessible from Antibes train station just over a quarter mile away or Nice Côte d'Azur Airport a 12-mile drive away. Wi-Fi is available throughout the residence, for an additional fee and public parking is available on site. Beau Site is in a residential area, 2 miles from central Antibes and a 10-minute walk from Garoupe beach. It features free Wi-Fi internet access and a pool. Hotel Beau Site’s soundproof guest rooms are individually decorated and have air conditioning as well as views of the sea, mountains or the garden. The Beau Site hotel serves a daily buffet breakfast. This can be taken in the dining room, on the outdoor terrace, or in the guest room. Guests have exclusive access to the hotel’s outdoor swimming pool. Hotel Beau Site also has bike rental. Free private parking is available exploring the Cote d’Azur region by car. Cannes is 9 miles from the hotel and Nice-Cote d’Azur Airport is 8.5 miles away. This sea-side hotel offers rooms with views of the Mediterranean, satellite TV and free Wi-Fi internet access. It is just a 10 minute walk from the old city of Antibes. Decorated in a Mediterranean style, all the rooms at the Josse Hotel are air-conditioned and feature a balcony with views of the sea or garden. There is also a private bathroom with a shower. Guests of the Josse can choose between a buffet or continental breakfast, which can be enjoyed on the outdoor terrace, or in the comfort of the guest rooms. The hotel also has a bar. The hotel is across from Salis Beach, just a 3 minute walk away and the center of town of Juan les Pains is within walking distance of Antibes Old Town and its ancient port. Olympe is in the heights of Antibes, between Nice and Cannes. This residence offers a swimming pool and a solarium just 3 miles from the beach. The air-conditioned apartments at Olympe have an LCD TV, Wi-Fi access and a furnished balcony. Each has a private kitchenette featuring a dishwasher and a fridge. There is also a microwave for preparing meals. Guests can enjoy a daily breakfast in the hotel’s cafeteria or on the terrace which overlooks the swimming pool. Other facilities include a laundromat and a parking lot with underground parking. The Olympe is 2.5 miles from Antibes town center and its Riviera beaches. Cannes and Nice Airport are both a 20 minute drive away. The residence is easily accessed from Highway A8, a 3 minute drive away and it is a 10 minute drive from Sophia-Antipolis technology park. Located on the French Riviera, this Appart'city features an outdoor swimming pool. The accommodations have air conditioning and include a balcony and wired internet access. The modern studios and apartments have a TV and a private bathroom. Each has a kitchenette equipped with a microwave, fridge and dishwasher. All apartments are serviced by an elevator. A buffet breakfast is served every morning at Appart'city Antibes. The residence is accessible via the A8 highway and private on-site parking is provided. Cannes Mougins Golf Country Club is 3 miles away and Port Vauban is an 8-minute drive from the residence. Mas Djoliba is a 2-minute walk from the beach in Antibes. It is set in a park and has swimming pool and terrace. Free Wi-Fi is available in the rooms. Each air-conditioned Djoliba room is equipped with a TV and private bathroom with a bathtub or shower. Mas Djoliba provides an ideal base for exploring Antibes-Juan-Les-Pins. The hotel is half a mile from Chateau Grimaldi and Antibes Cathedral and a 10-minute drive from Gare d'Antibes, Antibes’ train station. For guests wanting to discover other parts of the French Riviera, Mas Djoliba is conveniently located 7.5 miles from Cannes and 14 miles from Nice. A free and private locked parking lot is available. Between Juan-les-Pins and Cap d'Antibes beaches, Hôtel Le Petit Castel is near the Palais des Congrès. All rooms have free Wi-Fi internet access. The hotel has a solarium with a hot tub on the 4th floor. From there you can enjoy views of the sea and the mountains. Hôtel Le Petit Castel also offers a shuttle to and from the airport and train station. It is available upon request. Breakfast is served daily and can be had in the dining area or in the comfort of your room. Vogue Hotel is in Cap d’Antibes facing the sea, 900 metres from the La Garoupe beach. It offers private access to the shore and a heated swimming pool with hot tub. Rooms in the hotel are air-conditioned and have free Wi-Fi internet access. Some rooms offer a full view of the sea and all rooms are equipped with modern en suite facilities. The Vogue Hotel restaurant serves gourmet cuisine and features a terrace with a panoramic view of the sea. At the Vogue Hotel there is free private parking and free bicycle and scooter rentals. The Vogue Hotel is ideally situated on the Côte d'Azur between Antibes and Juan-les- Pins. The Castel Garoupe hotel is located 2 miles from Antibes and only 330 yards from the Garoupe sandy beaches. It has an outdoor swimming pool and tennis court. Castel Garoupe’s rooms and studios are air-conditioned and have a balcony. Some accommodations have kitchen facilities. The hotel serves a daily breakfast and guests can enjoy a drink on the terrace or at the poolside bar. Free public parking is available on site for guests exploring the Cote d’Azur region by car. Nice Airport is 12 miles away. This Campanile is located 2 miles from Antibes town center and 9 miles from the Nice-Cote d’Azur Airport. It offers free Wi-Fi access and has an outdoor swimming pool. Rooms at the Hotel Campanile Antibes are air conditioned and serviced by an elevator. They are equipped with satellite TV and tea and coffee making facilities. Breakfast is served daily at the Campanile Antibes - Juan les Pins Restaurant, which offers regional and traditional cuisine. Guests can also enjoy the grounds and terrace. The Campanile Antibes offers free private parking and is a 2-minute drive from the A8/E80 highway, which provides access to the French Riviera. In the heart of Antibes, Hotel La Place is a 10 minute walk from Port Vauban and the sandy beaches. It offers air-conditioned and soundproof rooms with flat-screen TV and free Wi-Fi access. Breakfast is served daily in the hotel’s dining room or on the terrace. At the Brasserie La Place, guests can enjoy Mediterranean cuisine. Hotel La Place is just 6 miles from Cannes and a 15 minute drive from Nice-Cote d’Azur Airport. Antibes Train Station is half a mile away. Less than 100 metres from the beach, Villa Fabulite is situated in the heart of Cap d´Antibes. This hotel features a restaurant and a games room. Villa Fabulite offers comfortable accommodation with private bathrooms. All of the rooms have a terrace where guests can relax. The Villa’s restaurant serves regional Provençal cuisine. Guests are invited to explore Fabulite’s garden and free Wi-Fi is available throughout the hotel. Villa Fabulite is also 1.2 km from The Jardin Botanique de la Villa Thuret, the 3.5 hectares botanical garden located on the grounds of the Villa Thuret. Located 5km north of Antibes town centre, the Bastide De La Brague is just a 10-minute walk from the Mediterranean coast and Marineland amusement park. It offers air-conditioned accommodation with free Wi-Fi access. Each guest room at the Bastide is equipped with a flat-screen TV and en suite facilities. Some rooms also have a private patio or balcony. Breakfast is available each morning and guests of the Bastide De La Brague can relax on the sun-deck terrace. An evening meal can be prepared upon reservation from April to September. Bastide De La Brague offers free private parking and is easily accessible by the A8/ E80 motorway. It is 11km from Nice-Côte d’Azur Airport. 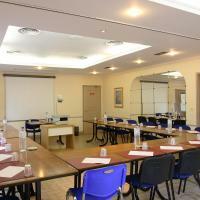 Hotel ibis Styles Antibes is located 2.5 miles from the center of Antibes, between Nice and Cannes. It offers modern rooms which come with flat-screen TVs and free Wi-Fi access. Each air-conditioned room comes equipped with a private bathroom. All rooms are accessible with an elevator. Guests can enjoy traditional cuisine with Mediterranean flavors and a continental breakfast in the restaurant or on the terrace. The hotel also has a private bar, which serves aperitifs and cocktails. The hotel has a 24-hour front desk with a children’s play area. Free private parking is available. The Mediterranean Coast is just 2 miles from the hotel and it is south of Sophia-Antipolis, close to Marineland. Cannes is 8 miles away and Nice 12 miles away. Royal Antibes - Luxury Hotel, Résidence, Beach & Spa provides free access to Les Cinq Mondes Spa, steam bath, fitness center and sauna and 2 restaurants with views of l’Ilette Bay. It is on the pedestrian promenade, which in 3 minutes, leads to the historic quarter, castle and Provençal market. This property includes suites, apartments and other rooms with a city view. An LCD TV and a minibar are featured in every type of accommodations at Royal Antibes. All accommodations are contemporary in style and some suites have magnificent sea views. The Italian-inspired Café Royal serves meals throughout the day. During the high season, Royal Beach features a terrace with sea views and offers Mediterranean cuisine. A private beach is available with an extra cost. The 24-hour front desk can inform guests about Cannes, just a 20-minute drive down the coast. Free Wi-Fi access is available throughout. Set 5 km north of Antibes, this resort offers 2 outdoor swimming pools, 1 paddling pool and 2 waterslides. You can explore the 4.5 hectare estate or go to the sea, 800 metres away. Camping Antipolis offers two-bedroom bungalows with a private terrace and views of the garden. Accessed through a private entrance, each one also has a lounge and a kitchenette for preparing meals. The resort offers a continental breakfast every morning, which can be enjoyed on the terrace. You can also relax with a drink in the mood-lit bar before sampling traditional, French cuisine in the restaurant. A children’s playground, a laundrette and tennis courts are just some of the other facilities at this property. Nice is 18 km away or you may also choose to go to Marineland water park, a 10-minute walk away. Villa la Pinède sits on a 1700m² park with a 128m² outdoor swimming pool surrounded by trees and a sun deck. It is 5 km from the centre of Antibes and a 10-minute drive from Cannes. Inside the villa you will find a suite and apartments. Some are self-catering with a microwave, refrigerator, dishwasher and an electric kettle. Some also feature a balcony with a pool view. Villa la Pinéde offers services upon request such as an airport shuttle service, guided tours in the surrounding area and motor-scooter rentals. Nice Airport is just 15 km from the residence. Free parking is available on site and free Wi-Fi internet access is available throughout the entire villa. Located on the French Riviera, these self-catering studios and apartments are just 200 metres from Garoupe Beach. A private terrace, a TV and free Wi-Fi access feature in each accommodation. All of the air-conditioned studios have a simple décor, and some of them offer a view of the garden. The bathrooms are fitted with a walk-in shower and the apartment also has a sofa. The kitchenettes at L'Orangeraie du Cap are equipped with a microwave, electric hotplates and a fridge-freezer. Additional facilities include a dishwasher, board games and you can borrow a DVD player upon request. Juan-les-Pins Train Station and Vauban Port are both 4 km from these studios and apartments, and private parking is free on site. Set just 100 metres from the beach and 50 metres from the sea, these apartments offer a private, furnished terrace. 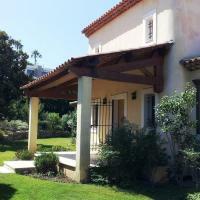 They are a 10-minute walk from the centre of Antibes and a 5-minute drive from Juan-les-Pins. 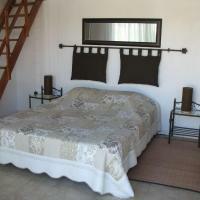 The accommodation at Appartement San Mickael features 1 bedroom and a living room with a kitchenette. You will be able to watch DVDs on the LCD TV or listen to music on the iPod docking station. Meals can be prepared using the oven and hotplates in the kitchenette. A washing machine, ironing facilities and a dishwasher are also provided for your convenience. Private parking is available with an extra cost and the A8 motorway is 5 km away. As well as relaxing on the beach, local activities include driving the 15 minutes to both Cannes and Cagnes-sur-Mer. Just 100 metres from the beach, these apartments are 1.3 km from Antibes Train Station. Each air-conditioned apartment has lift access and features an east-facing terrace with partial sea views. The colourful apartments at Elysee Foch have a seating area with a flat-screen TV and a DVD player. The kitchenettes are equipped with electric hot-plates, a dishwasher and a microwave. 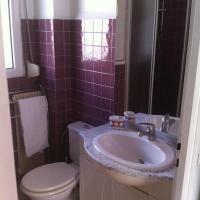 Appartement Elysee Foch is 15 km from Nice Airport and a 25-minute drive to the centre of Nice. Cannes is 17 minutes by car. An airport shuttle service is available upon demand and at an extra charge. Ce camping est situé à 450 mètres de la plage et dispose d'une piscine ainsi que de mobile homes avec terrasse et kitchenette. La gare d'Antibes se trouve à 3,3 km de l'établissement. Tous les mobile homes chauffés du Camping Douce France possèdent une armoire et une salle de bains privative avec douche. Une connexion Wi-Fi est disponible moyennant des frais supplémentaires. Lors de votre séjour, vous aurez la possibilité de préparer vos propres repas. Chaque mobile home dispose d'une kitchenette avec ustensiles de cuisine et réfrigérateur. Ce camping se situe à 2,5 km du parcours de golf de Biot et à 350 mètres du parc animalier Marineland pour lequel vous pourrez acheter des billets à prix spécial. Un parking privé est disponible gratuitement sur place. Situated 3.6 km from Antibes city centre, this self-catering apartment features a furnished balcony with garden view, a washing machine and ironing facilities. Free private parking is available and the Train Station is 2.5 km away. An electric kettle, microwave and fridge are provided in the equipped kitchenette. Appartement Le Gerald also includes a small dining room and a living room with a sofa bed, radio and LCD TV. The supermarket is only 1 km away and the bus stop is 50 metres from the apartment. A children’s playground is 50 metres away. Juan-les-Pins is a 7-minute drive away and the Grimaldi Castle is 4 km away. Nice Côte d'Azur Airport is a 15-minute drive away and the A8 Motorway is only 2 km from Appartement Le Gerald. Hotel Pilotel is located in Antibes, only 800 metres from the beach. All of its rooms feature a flat-screen TV with cable channels. They all offer a view of a garden. The bedrooms are decorated in a modern style. Guests can use the free Wi-Fi access or watch TV in the room. The bathrooms are fitted with a shower and have free toiletries. A breakfast can be served every morning in the dining room, which offers direct access to the garden. The Marineland Theme Park is only 500 metres from the Hotel Pilotel. There is a private car park on site. Located on the second floor of a residence, Appartement Jardin des Roses is 200 metres from the beach and 3 km from Antibes Old Town. It features a balcony with sea views and free private parking. An LCD TV and DVD player are available in this apartment, as well as a washing machine, ironing facilities and vacuum cleaner. 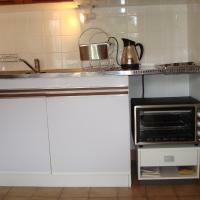 The fully equipped kitchen includes hotplates, coffee maker and oven. Towels and linen are provided. A wide range of bars, restaurants and a supermarket are less than 1 km away. The local market takes place every day and Antibes market is 3 km from Appartement Jardin des Roses. The amusement park Marineland is 2.4 km away and Juan-les-Pins, with its many nightclubs and bars, is a 10-minute drive away. Antibes Train Station is 2 km away and Nice Côte d'Azur Airport is a 14-minute drive from this apartment. This apartment residence is set in a 19th century building in Antibes, just 850 metres from the beach. It is 600 metres from Antibes Train Station and offers self-catering studios with free Wi-Fi internet. Each studio includes a kitchenette with a microwave and a refrigerator. A dining area is also provided, and some rooms have air conditioning, views of the courtyard and a flat-screen TV. Bed linen and towels are supplied. Guests are invited to enjoy a free coffee and a croissant on arrival. 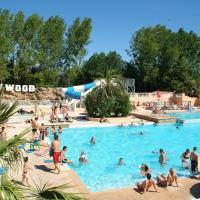 Studios Perl is 550 metres from Port Vauban and 300 metres from the old town. Cannes is 10 km away and Nice Côte d’Azur Airport is reached by car in 20 minutes. Located in Antibes city centre, Appartement le Gazan is just 300 metres from the beach. The apartment offers a terrace, which includes tables and chairs and views of the sea. The apartment is air conditioned and features a seating area with a TV, DVD and CD player. It is complete with a fully equipped kitchen. A stove, dishwasher and microwave are also provided. The apartment’s ideal location allows easy access to the city’s shops, bars and restaurants. 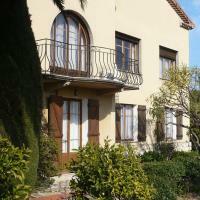 It is a 10-minute walk to Antibes Train Station and only 15 km from Nice Airport. Located a 15-minute walk from the city centre, Appartement Villa Virevent offers a private garden with BBQ facilities. Antibes Beaches are situated 1.5 km from the apartment and Cannes is 15 km away. Set on the ground floor of a villa, this fresh and functional apartment features garden views, a washing machine and a TV. It is complete with fully equipped kitchen and private bathroom. The apartment is located 300 metres from shops and restaurants and Nice is only a 25-minute drive away. Marineland Aquatic Zoo is 4 km away and free private parking is available on site. Villa Bellavista is set in a 2000 m² garden 4 km from the centre of Antibes and 3 km from the Marina. It offers self-catering accommodation, sea views and free Wi-Fi access. An outdoor swimming pool and a terrace are available. Villa Bellavista includes a villa and an apartment with a seating area, a desk and a wardrobe. Each accommodation type has a bathroom with free toiletries and a shower. The villa has a private terrace. Guests can prepare their own meals at the property. A kitchen with kitchenware, a microwave and a coffee machine is provided in both the apartment and the villa. 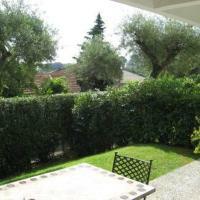 This property is 20 km from Cannes and free secured parking is provided. For stays of 2 weeks or more, you will benefit from 1 free manicure. Situated in Antibes, 300 metres from the beach, this B&B offers an outdoor swimming pool, free Wi-Fi and pétanque facilities in the garden. With free private parking, the property provides a bike rental service. With a garden view, rooms at Villa Aloha include an LCD TV, a safe and a private bathroom with shower. A continental breakfast is offered daily in the dining room. You are invited to relax on the terrace or play billiard. Juan-les-Pins is 2 km away, Cannes is a 15-minute drive away and Nice is 25 km from Villa Aloha. Apartment block, 5 storeys. In the centre of Antibes, am Meer, 70 m from the sea, road to cross. In the complex: lift. Shop 70 m, restaurant 50 m, railway station 2 km, sandy beach 70 m. A building is being constructed next door. 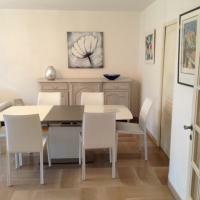 Apartment Rue De La Pompe Antibes is a self-catering accommodation located in Antibes. The property is 3.9 km from Marineland Antibes. The apartment have a living/dinning room with TV, DVD player and terrace. There is a full a kitchen with a microwave and a refrigerator. A bathroom with shower and separate toilet. Côte d'Azur Airport is located 11 km from the property. The property offers free parking. Surrounding info:Plage de la Gravette (beach) is less than one kilometers away. Holiday Home La Maison de Renee Antibes is located in Antibes/Côte d'Azur. The accommodation will provide you with a living room featuring TV, DVD player and exit to the balcony. The kitchen is equipped with microwave and refrigerator and a separate dinning area is available. If you feel like visiting the surroundings Marineland Antibes is 3.7 km away. This holiday home is 11 km from Côte d'Azur Airport in Nice. 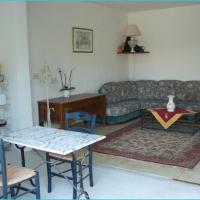 Apartment Les Alizees Juan Les Pins is a self-catering accommodation located in Antibes. The property is 4.8 km from Marineland Antibes. The apartment offers a living room with sitting and dinning area, TV and dvd player.There is a full a kitchen with refrigerator, dishwasher, stove, oven and microwave. Extras include washing machine. Two bedrooms and a bathroom with separate toilet. Côte d'Azur Airport is located 12 km from the property. The property offers free parking. Surrounding info: beach is 1 kilometers away. Apartment Res Les Eucalyptus Antibes is situated on the 2nd floor of a building that comprises of eight 2-storey residences with no lift. It is 3 km from the centre of Juan les Pins and 2 km from the centre of Golfe Juan. Just 400m from the beach. The apartment provides various amenities such as satellite TV, washing machine and dishwasher. For shared use there is a 3ha fenced park with lawn, flowers and trees, an swimming pool (17 x 10 m, 01.06.-30.09. ), paddling pool, outside shower and table tennis. Shop, restaurant and bus stop in 300 m, sandy beach in 400 m. Please note that there are more similar properties for rent in this same residence. Apartment Res Les Eucalyptus 2 Antibes is situated on the 1st floor of a building that comprises of eight 2-storey residences with no lift. 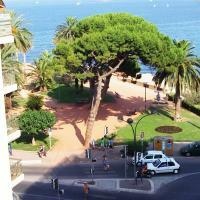 It is 3 km from the centre of Juan les Pins and 2 km from the centre of Golfe Juan. Just 400m from the beach. The apartment provides various amenities such as TV, radio, CD-player, washing machine and dishwasher. For shared use there is a 3ha fenced park with lawn, flowers and trees, an swimming pool (17 x 10 m, 01.06.-30.09. ), paddling pool, outside shower and table tennis. Shop, restaurant and bus stop in 300 m, sandy beach in 400 m. Please note that there are more similar properties for rent in this same residence. Apartment Res Les Eucalyptus 3 Antibes is situated on the ground floor of a building that comprises of eight 2-storey residences with no lift. It is 3 km from the centre of Juan les Pins and 2 km from the centre of Golfe Juan. Just 400m from the beach. 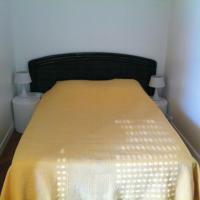 The apartment provides various amenities such as flat screen TV, washing machine and dishwasher. For shared use there is a 3ha fenced park with lawn, flowers and trees, an swimming pool (17 x 10 m, 01.06.-30.09. ), paddling pool, outside shower and table tennis. Shop, restaurant and bus stop in 300 m, sandy beach in 400 m. Please note that there are more similar properties for rent in this same residence. 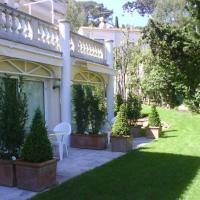 Apartment Les Jardins d Adonis Antibes is 4 km from the centre of Antibes, 4 km from the beach. The apartment provides a TV and dishwasher. There is also a lift and electric heating. For shared use there is a swimming pool fenced (8 x 4 m, depth 100 - 200 cm, 15.05.-15.09.). Shop and supermarket are in 2km, railway station in 3km, sandy beach in 4km. Golf course in 6km and Marineland in 5 km. Apartment Les Asteries lot 958 Antibes is located in the district of Cap d'Antibes, on the outskirts, 850m from the sea. The apartment provides a satellite-TV, radio, dishwasher and washing machine. For shared use there is a 4300m2 park and lawn. Shop is in 50m, restaurant in 800m, sandy beach and pebble beach in 850m. Overlooking the Mediterranean Sea, Hotel du Levant is just over 1 mile from the historic center of Antibes and Juan-les-Pins. A continental breakfast is prepared every day and the air-conditioned rooms have free Wi-Fi access. Decorated in a traditional style, the guest rooms all have satellite TV, a minibar and a telephone. Most of the rooms feature a balcony or terrace with a sea view, and the bathrooms include a hairdryer. Fresh bread and pastries and fruit juice for breakfast can be enjoyed on the terrace or in your room. The beach-front restaurant is open for lunch and specializes in seafood, salads and grilled meat. With a secure parking lot free of charge, this hotel is 10 miles from Cannes and 19 miles from Nice. It is 28 miles from Monaco. La Jabotte is a 5-minute drive from the centre of Antibes and 60 metres from the beach. It offers free Wi-Fi access, a terrace with outdoor furniture and colourful rooms with garden views. Providing direct access to the patio, all rooms are individually decorated and feature a wardrobe and a private bathroom with free toiletries, a hairdryer and a shower. A continental breakfast with pastries, fruit and homemade jam is served every morning at La Jabotte. Guests can enjoy regional dishes in the on-site restaurant and have a drink in the bar. Laundry facilities and an iPad are at guests’ disposal on request. Juan-les-Pins is 3 km from the hotel and free private parking is available on site, availability permitting. Located in Antibes, just a 5-minute walk from the beach, Riviera Best Of – Cap d’Antibes offers self-catering accommodation in a modern residence building. The apartment features views of the communal outdoor swimming pool. The air-conditioned apartment features a living area, a flat-screen TV and private bathrooms with a bath or shower. Ironing facilities are also available. The fully-equipped kitchen includes a stove, oven, microwave and refrigerator. Supermarkets and shops can be found 200 metres away. Riviera Best Of – Cap d’Antibes is situated 6 km from the animal theme park Marineland and 3 km from Port Vauban. Anitbes Train Station is 2 km away and Nice Airport can be reached in 30 minutes by car.